He has participated in several projects in Los Angeles (Dannie Cove Big Band, Storacci Sextet, Carlos Miralles group, Bhrama Nada and the Nuñez/Tomlinson/Weiss trio), and in New York (Nuñez-Bagnato duet, the Charlie Martins quartet and several versions of the Claudio Nuñez trío, quartet or quintet with people like Sam Hendrix, John Riley, Larry Granadier, Matt Wilson, Charles Gayle, William Parker, George Fernandez, etc. ), covering the space from modern jazz to freejazz and avant garde classical to indian classical music and new tango. 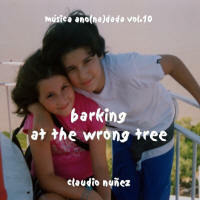 Barking At The Wrong Tree by Claudio Nuñez is licensed under a Creative Commons Attribution-Noncommercial-Share Alike 3.0 Netherlands License.